Places I've hung out in, sometimes briefly. 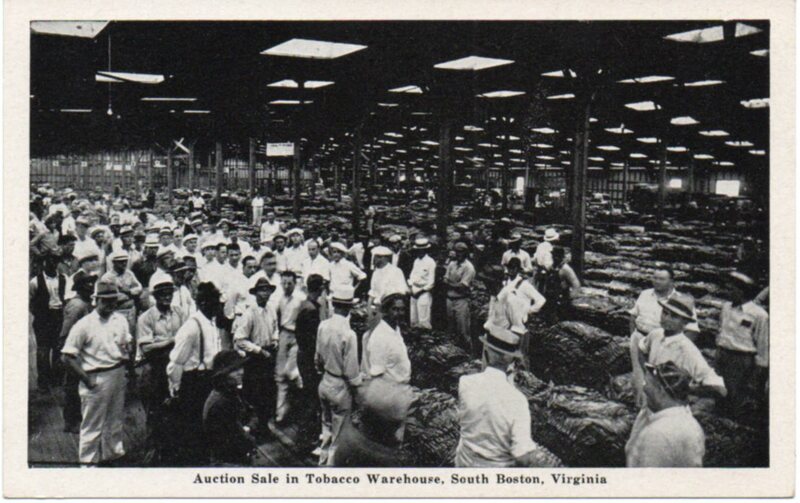 This card shows a tobacco auction sale at a warehouse in South Boston VA. According to the note on the back, the auction started on September 23, 1946. 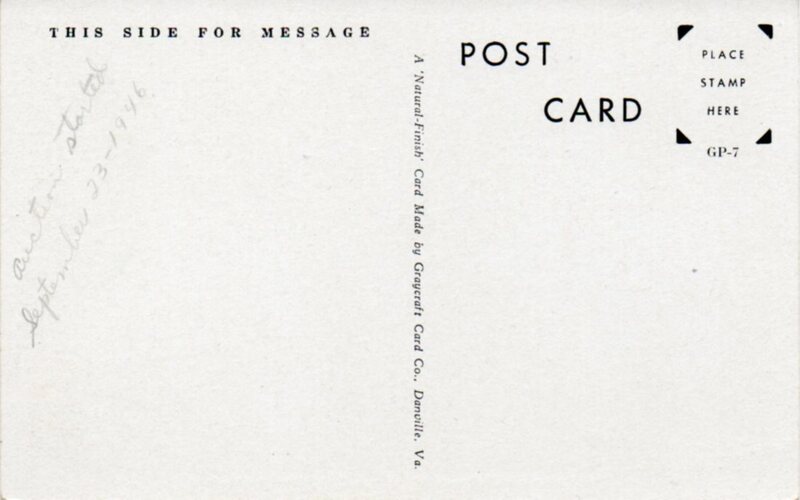 It’s a “Natural Finish” card made by Graycraft Card Co., Danville, Va. Interesting, because Danville was one of the early tobacco markets in the southeast. This is the only card I have that shows a tobacco auction in progress. I got interested in the tobacco auctions, long gone since 2005 or so, after I chatted with the owner of a former warehouse. Tobacco warehouses and auctions and allotments…these were just part of the landscape that I barely noticed growing up. I tied some tobacco for drying once when I was a kid. My hands and anything else that came in contact with the leaves got all tarry. Hello, Lava soap! Luckily, we didn’t grow tobacco and I managed to avoid that duty again. Morristown, New Tazewell, Johnson City, Mountain City, Greeneville (among many others) were large markets. Tobacco was a huge cash crop. The tobacco would be harvested in July or August, then wrapped in bundles and hung on rods in barns to air dry (there were other ways to do this). The auctions in this area ran from October to late January. Professional graders and auctioneers would go from town to town to take care of it all. Literally millions of pounds of tobacco would be bought by the big companies, re-dried and packed in hogsheads for shipping by rail or trucks. If it had been a good year, the farmer took home enough money to do Christmas and get through to the next year. Then it all went to hell. The major companies decided to deal directly with the farmers on a contract basis, the campaign against tobacco use got serious, and the federal government politely stepped away from the whole thing. Tobacco is still grown. We have good soil for Burley. White Burley tobacco (for all intents and purposes, the “cigarette tobacco”) originated in Ohio (natural mutation) in the late 1800s. In 1884, the Duke family in North Carolina let loose a cascade of perfectly rolled machine-made cigarettes. R. J. Reynolds introduced Camel cigarettes in 1913 and need for good “Virginia” burley (bright) to blend with Turkish tobacco increased, prompting farmers in this area to go for it. And the tobacco companies spent fortunes in advertising their products. Literally millions and millions of pounds of tobacco changed hands each of the years that smoking was rampant. Mid-1930s to early 2000s. Now the warehouses are either gone or used for storage and/or flea markets.